The day of your conference is finally here! Keep your day-of schedule on track with our conference agenda template. At well-planned events, attendees can easily access the conference agenda to see what’s next, but conference planners need to be several steps ahead to make it happen. Yet keeping track of your minute-by-minute to do list—and any important files that go with it—can be difficult. One misstep can lead to poor conference timing and unhappy attendees. 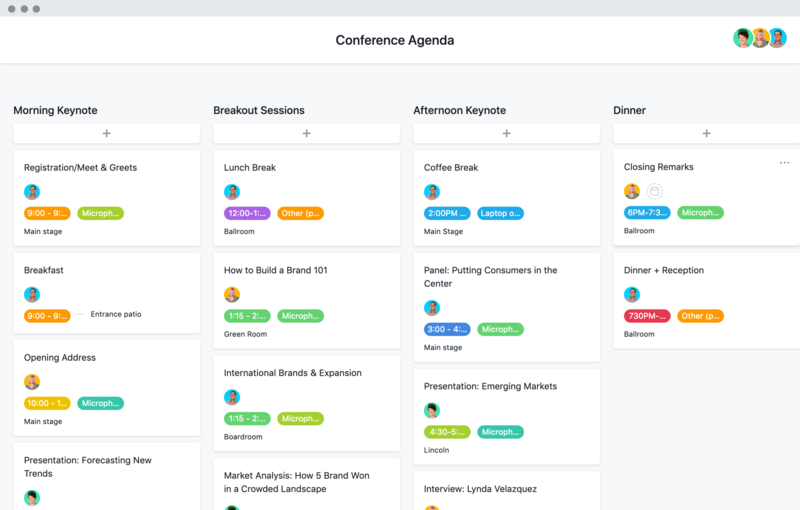 Our conference agenda template gives you the confidence to keep track of all the moving pieces in one place, while keeping your vendors, speakers, and teammates in the loop along the way. Stay on schedule, down to the minute. Keep your conference schedule tight by making deadlines clear—down to the minute—with task due dates and times. Access your agenda anytime. While you’re onsite at the event, our mobile app makes it easy to find what you’re looking for, without opening several other apps. Organize work, your way. Event organizers need to see information differently than presenters or technicians. Template tasks can be grouped and sorted in a variety of ways to make to-dos and blockers easier to spot for anyone. Keep important files in one place. Did your speaker forget to print their notes? No problem. Attaching files to conference agenda items makes it easy for anyone to access them quickly. Your conference agenda is the backbone of your event. Starting with an Asana template keeps everyone aligned and on time so you can deliver a flawless conference flow for attendees. Bring your brand to life and connect with customers with these five tips. Conference planning is stressful, but our short tutorial can bring you peace of mind for the big event. Set yourself up for success with tips from experts at Asana and Eventbrite. Register for our event planning course to learn the best way to manage your conference in Asana. What if you could plan and manage your next conference 45% more efficiently? Don’t wonder. Find out with a trial of Asana Premium.